This week was quiet in the print room as it seems tutorials were happening all round, and also road closures due to weather delaying students. But there was some activity, and one student was interested in my work and talked for a while before moving on to see the technician about her printmaking requirements. 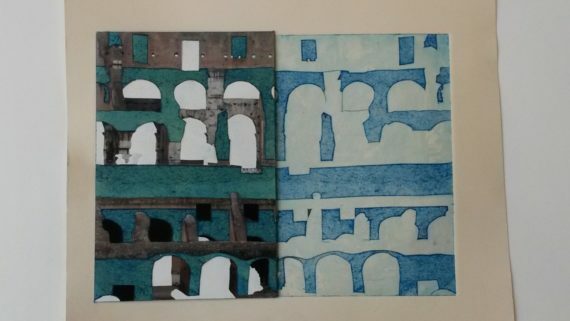 I thought in this blog I would include a sketchbook reference, as I have been working through a sketchbook during the residency. 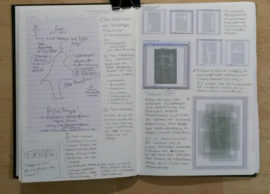 Ideas keep coming but during this residency it seems that this has accelerated considerably. 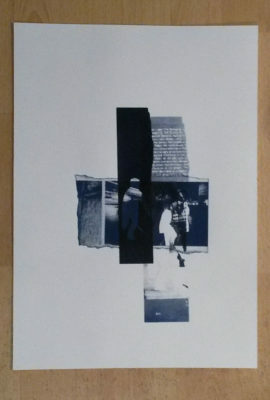 I now have several secondary print series on the go. 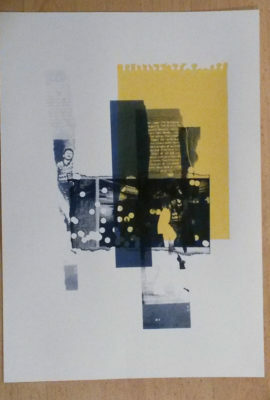 The main series now has a screen print only version with a slight change in emphasis these are stand alone pieces, rather than the main collage series which is to be essentially an installation. I also have begun development of a ‘Devices’ series and a combination set which takes on other ideas relating to my older Tracing the Everyday ideas. I spent much of this week organising and making preparations for the new and main series to be printed next week. I will also start a series called ‘Reportage’ that works exclusively with transparent veils, as in the sketchbook pages images here. 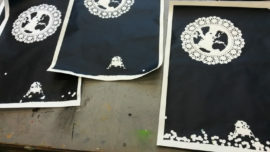 The mock up works and the reporters notebook page stencil prints effectively in the combination print pictured here with the yellow patch. 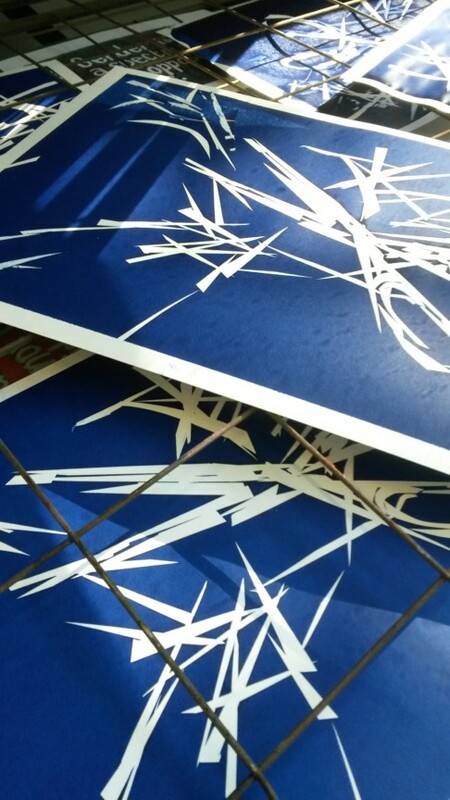 More later and the Simulacrum print series will be even larger by next week. It seems to me that residencies effectively push your work on, I should have done this years ago, well if I could have spent less time teaching fulltime. 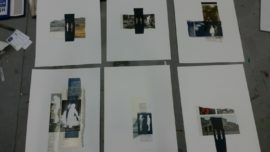 The main body of work for the residency has begun. 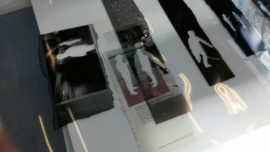 Over the past two weeks I have prepared and developed some of the prints for a large installation of prints. 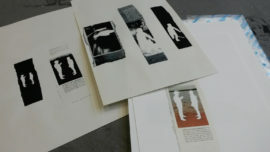 The process is very fluid as I cut out aspects of the found images, scan some of them to screen print, stick some to paper ready for printing, and then in the print room the individual pieces are still not resolved. I still have to make those final decisions and modify the prepared images further to make the narrative work, and then again the narrative also shifts and changes. When I say narrative, you guessed it, it is not a fixed narrative, or ‘story’, in that sense. It is really and series of discursive steps and diversions using ‘the copy’ to keep shifting the referents in the original images. By original I mean the source images which are only ever partial and cannot be considered as conclusive images in themselves. They may intimate associations and the original form and context from which they came, but as the repetition increases the process of deferment increases. 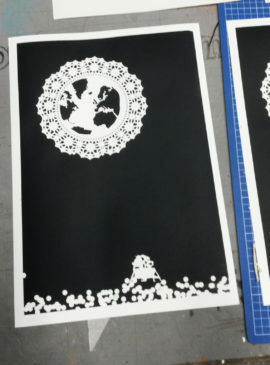 I am working on another batch to follow and those will also work into some of the first batch of prints. Well as an explanation, I think that was definitely discursive enough. I will get back to theory at a later point, and leave it there for now. All will become apparent in completion. 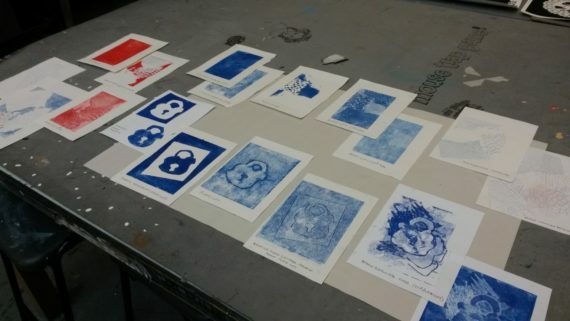 This week was good as Dale Devereux Barker was in the print room with some level 4 students teaching them printmaking as part of their year one introduction modules for the degree course. So it was a busy room, and I got some interest with some students making enquiries about my work and ideas. There was some interesting and well made work created by the students. Well no comments yet, and there was I thinking that I might get picked up on the claim that blogging results in clarity. Not sure that the last post I nailed it, clarity, that is. 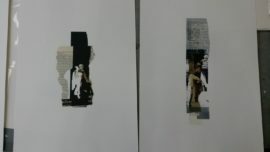 This thing about the simulacrum is varied for me, as I am interested in how images work and how language works and how issues about ‘The Copy’ can be considered and how printmaking as a vehicle for production can be used to create images that will specifically address conditions that are recognised about our technological age and the deluge of images that we encounter. There, I think I got it, they are the broad aims and reference points. Now to breaking it down. If an image is a copy, and a copy without an original, then the thing it is created from or with, may be from the world (discernibly a thing that pre-exists the final image) but may or may not contribute to forming the image in terms of being a referent. In other words The reference is possibly neither index or sign. On the other hand some of my ideas are about sign and associations. The Tracing the Everyday series that I am still working on includes the use of things from the world, objects, to form the method of making the image. 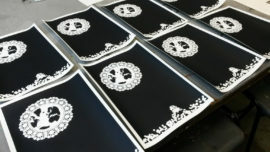 Earth Rising is the latest print run finished and now dry the limited series has variations because of the method, as well as a constant overall representation. The doyley associates domesticity against the remoteness of space travel. The whole series has a divergent aspect, and readings create a certain uncertainty. 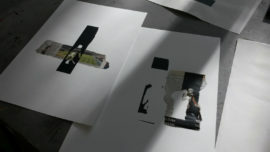 The second image shows artists proofs in this case proof of the difficulty of using these kinds of making fragments, proof of error in this case. But the difficulty helped in terms of distribution to create the unstable moon surface. I like the uncertainty that means resolving the ideas and image is only concluded at the end.